WASHINGTON, DC--(Marketwire - Sep 10, 2012) - It is always heartwarming to see young volunteers taking the time to help others. And for the past 17 years, The Prudential Spirit of Community Awards program has recognized and celebrated their efforts. This awards program, sponsored by Prudential Financial, Inc. in partnership with the National Association of Secondary School Principals (NASSP), honors outstanding community service by students in grades 5 through 12 at the local, state and national level. 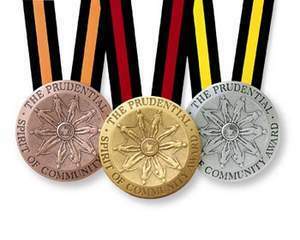 Since 1995, Prudential Spirit of Community Awards have been given to more than 100,000 middle and high school students across the country for helping the less fortunate, promoting health and safety, protecting the environment, and serving their communities through many other volunteer activities. This month, with the opening of the 2013 application period, the search continues for thousands more students who have made meaningful contributions to their communities over the past 12 months. "We have been recognizing youth volunteers since 1995 -- and still, every year, we're amazed by the stories of exemplary community service," said Prudential Chairman and CEO John R. Strangfeld. "We look forward to honoring the top youth volunteers of 2013 for their selflessness, their initiative and their dedication to changing communities for the better." Know a student who should apply? Young volunteers can apply online at http://spirit.prudential.com or at www.nassp.org/spirit. Applications must be completed by November 6, 2012, and then submitted to a middle or high school principal, Girl Scout council, county 4-H agent, American Red Cross chapter, YMCA, or affiliate of HandsOn Network. Paper versions of the application form are available by calling (877) 525-8491 toll-free. Participating schools and local organizations will select Local Honorees in early November and present them with Certificates of Achievement. These Local Honorees also will receive the President's Volunteer Service Award if they have contributed the minimum number of volunteer hours to qualify (50 hours for age 14 and younger, 100 hours for those older). All Local Honorees are then reviewed by a state-level judging committee, which will name the top two candidates from each state and the District of Columbia -- one high school student and one middle level student -- as State Honorees on February 5, 2013. Runners-up at the state level will receive bronze medallions or Certificates of Excellence. "We have learned in the past 17 years that, on any given day, thousands of middle and high school students are volunteering in communities across America," said JoAnn Bartoletti, executive director of NASSP. "As the search begins for the top youth volunteers of 2013, we hope that our message to those students is clear: we acknowledge, respect and commend you for your service." The Prudential Spirit of Community Awards represents the United States' largest youth recognition program based solely on volunteer service. The awards program also is conducted in Japan, South Korea, Taiwan, Ireland and India, where Prudential has significant business operations. NASSP (National Association of Secondary School Principals) is the leading organization of and national voice for middle level and high school principals, assistant principals, and all school leaders from across the United States and more than 45 countries around the world. The association provides research-based professional development and resources, networking, and advocacy to build the capacity of middle level and high school leaders to continually improve student performance. Reflecting its longstanding commitment to student leadership development as well, NASSP administers the National Honor Society™, National Junior Honor Society®, National Elementary Honor Society®, and National Association of Student Councils®. For more information about NASSP, located in Reston, VA, visit www.nassp.org. Prudential Financial, Inc. (NYSE: PRU), a financial services leader, has operations in the United States, Asia, Europe, and Latin America. Prudential's diverse and talented employees are committed to helping individual and institutional customers grow and protect their wealth through a variety of products and services, including life insurance, annuities, retirement-related services, mutual funds and investment management. In the U.S., Prudential's iconic Rock symbol has stood for strength, stability, expertise and innovation for more than a century. For more information, please visit http://www.news.prudential.com/. Now in its 18th year, The Prudential Spirit of Community Awards have been given to more than 100,000 middle and high school students across the country for helping the less fortunate, promoting health and safety, protecting the environment, and serving their communities through many other volunteer activities.